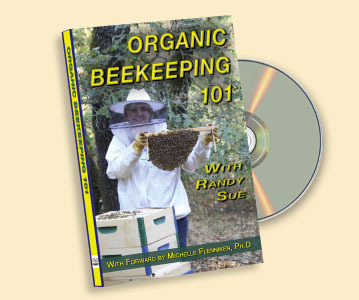 This educational DVD focuses on organic beekeeping, the way nature meant for bees to be raised. The purpose of the DVD is to educate the novice beekeeper. Professionally filmed footage in a step-by-step format enables the new beekeeper to easily understand and implement the organic principles as they establish their own hives. If you are already an experienced beekeeper, this DVD is a great way to educate your family and friends who want to know more about beekeeping. It also makes a great gift for anyone expressing an interest in starting their own hive. Organic Beekeeping 101 contains beautiful close-up, detailed video of what goes on inside the hive, including bee types, emerging brood and the pollen-gathering process. This DVD explains how to become a beekeeper in a simple, natural way and is segmented into the 11 chapters outlined below. We've also provided you with some sample segments of the DVD to show the quality content we've captured. This DVD is perfect for the beginning beekeeper and provides all the information you need to start and maintain your hives naturally.